Philippians 3:20, 21: For our citizenship is in heaven, from which we also eagerly wait for our Savior, the Lord Jesus Christ, who will transform our lowly body that it may be conformed to His glorious body, according to the working by which He is able even to subdue all things to Himself. 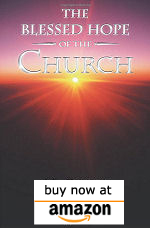 The Blessed Hope of the Church is the church’s glorification and departure from the earth. It is the event by which the Son of Man brings many sons to glory (Hebrews 2:10). This is not a made-up doctrine contrived by the thoughts of man. All biblical principles and truths speak of the validity of this teaching and its occurrence before the coming tribulation. For the believer/church, the rapture is its sure and steadfast hope, its constant expectation. Chapter 11 – His Coming or His Appearing?